For the purpose of this article, we are going to use the definition of God (YHWH) contained in the Holy Bible. As such, God is the Creator of the universe (matter, energy, space, and time), along with other principalities and beings whose primary existence is outside this universe. However, God did not just create the universe and leave it to its own fate as deists proclaim. God is the personal being who walked and talked with Adam and Eve, the first human beings, in the Garden of Eden. God is also Savior of mankind, coming to Earth in the person of Jesus of Nazareth (Yeshua HaMashiach) to provide the ultimate example of holiness and the ultimate sacrifice for humanity’s evilness, in order to restore our personal relationship with Him. According to Christianity, God is the self-existent One, having no need of being created, since He has existed forever and is the cause of all things, including the dimension of time, to which He is not subject.. Likewise, God is not subject to the physical creation, but is spiritual in nature, residing in the spiritual dimensions of heaven. God’s power over the physical creation is absolute, such that He can manipulate matter, energy, space, and time at will. For this reason, God is said to be all powerful—able to accomplish any possible task He wills to do. Along with being all powerful, God is also all knowing—having knowledge of all things that are possible to be known, including the entire history of the universe—past, present, and future. Because God is all powerful (omnipotent) and all knowing (omniscient), He is also able to be present at all places at all times (omnipresent). God is also all loving—according to the Bible, “God is love” (1 John 4:16). The love of God prompted Him to create human beings in His image, in order to share His love with us. The Christian scriptures say that we can fulfill the entire law of God by loving Him and loving our fellow human beings (Matthew 22:37-40). God is absolutely holy—without any moral or character defect. In fact, the Bible says that God is incapable of doing any evil, despite being all powerful. God is unchangeable. In other words, He does not change any of His attributes or character at any time. Despite humanity’s tendency to change its definition of morality, God’s moral character does not evolve with the times, but remains constant. Christan Apologetics and Research Ministry: Who is God? The Scriptures tell us that God has many different names. The following article lists many of these names. 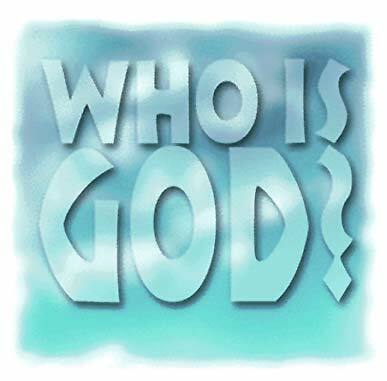 GotQyestions: What are the different names of God and what do they mean? GotQuestions: Does God have a physical body? GotQuestions: Us God male or female? This article will also address why I refer to the Old Testament as the Tanakh, the Five Books of Moses as the Torah, the New Testament as the B’rit Chadashah, Jesus Christ as Yeshua HaMashiach, God as YHWH or Yahweh, and the Holy Spirit as the Ruach HaKodesh. In this day and age, Universalists and the Interfaith Movement claim that all people worship the same god and that all paths lead to heaven. This is simply not true, there can only be one truth. Anything else is a contradiction. GotQuestions: What does the Bible teach about the Trinity? Hopefully, this article will answer all the questions that were posed by the individual who sent me a message. May God bless you and keep you always. Shalom!